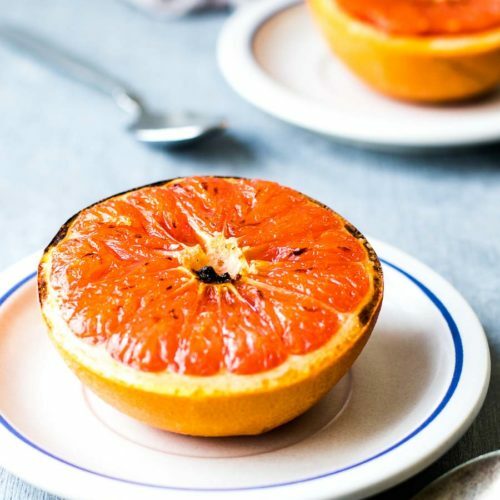 With no refined sugar, this 2 ingredient recipe for broiled grapefruit is an easy way to bring out the sweet-tart flavor of ruby red grapefruit. Slice the grapefruit in half crosswise - so that the blossom end is facing up or touching the cutting board. To make eating a lot easier, use a paring knife to cut down and along the segment membrane lines. This will make the finished broiled grapefruit a breeze to scoop out to eat! Sprinkle each grapefruit half with a tablespoon of sugar each. Broil 5 minutes or until the top is a tinged with a deep golden brown color as shown. Serve warm.